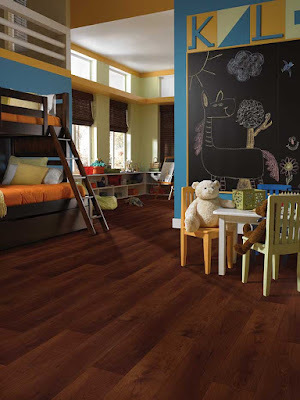 Luxury vinyl - also known as resilient flooring - is a popular floor choice for many Indianapolis homes. Not familiar with luxury vinyl? It's a floor choice that brings all the easy maintenance and comfort of vinyl to the high-end look of hardwood or natural stone tiles. Honestly, people have a hard time telling the difference without getting on their hands and knees to look at the floor! You know what can instantly tell the difference? Your budget. If you're looking for the look of natural hardwood floors or stone floors, consider luxury vinyl. It's a practical and affordable floor choice that can be installed in any room of your home. For many Indianapolis homeowners the beauty of luxury vinyl goes beyond the appearance. The real benefit lies in its easy maintenance. Luxury vinyl flooring is water resistant and extremely durable. The best way to take care of your luxury vinyl - and any hard surface floor - is to sweep it regularly. We recommend sweeping it at least once a week to remove the dirt and debris that is tracked in by pets and shoes. Over time that dirt can scratch and dull the surface of your flooring. No harsh chemicals needed! If you have dirt or spills that need to be mopped, use clean water. If needed you can use diluted floor cleaner but keep the strong floor cleaning chemicals out of your cabinet. This tip holds true for any floor. It's true that your luxury vinyl is moisture resistant but that doesn't mean you should let a spill of any kind sit on the floor where it can damage the finish over time. Blot the spill with a clean cloth. Then clean the area with a damp cloth or mop to remove any residue. Add high quality door mats. The biggest factor for floor damage is simple, small dirt. Stop the dirt from coming in the house by investing in good quality door mats at all of your outside doors.